On-loan Aberdeen midfielder Dominic Ball. Aberdeen manager Derek McInnes is optimistic Dominic Ball will agree a permanent move to Pittodrie. The Rotherham United defender has enjoyed an impressive season during his second loan spell with the Dons and is out of contract in the summer. McInnes said: “We have had plenty of conversations with Dom and he knows how I feel. Andrew Considine has triggered a new one year extension by virtue of the number of appearances he has made this season but a new deal is yet to be announced. The futures of Graeme Shinnie and Gary Mackay-Steven remain unclear but Luton Town manager Mick Harford admitted on Thursday that Dons captain Shinnie is on his radar. McInnes, meanwhile, has been delighted with the impact made by youngster Dean Campbell before the international break, particularly in the 2-0 Scottish Cup quarter-final replay win against Rangers. He said: “I think it was the type of performance at Ibrox that I expected from Dean. 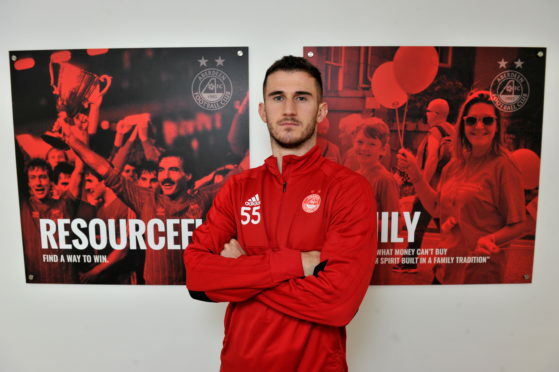 He has a good temperament and is similar to a Lewis Ferguson and Scott McKenna as in that he takes on information, knows his role and is a smart role. He gets it. “Sometimes in a hurly burly game Dean maybe isn’t as effective but his display at Ibrox would have been great for his experience and confidence. It is great for me seeing him deal with the games the way he has.